Experienced dentist, Dr. Steven White, and partner Dr. Brad Haines welcome new patients with missing teeth to experience the benefits of dental implants in Huntersville, NC, with or without a referral. Drs. White and Haines use the advanced technology of cone beam CT imaging to place dental implants with greater accuracy and precision. Drs. 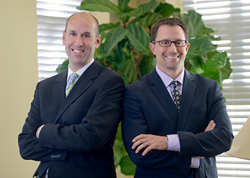 Steven White and Brad Haines welcome new patients interested in dental implants in Huntersville, NC for a consultation at their state-of-the-art practice in Cornelius, NC, with or without a referral. Dental implants are a life-like, long-term solution to tooth loss and help promote better oral health. Drs. White and Haines are experienced dentists who place dental implants using 3D imaging technology for improved accuracy and predictability. Tooth loss can cause both aesthetic and functional complications that may result in a decrease of self-esteem and oral health. If a tooth is lost or extracted and not replaced by a dental implant, the natural stimulation by the tooth root that occurs during biting and chewing is lost as well. Without this stimulation, the jaw bone will degrade and lose structure, potentially causing adjacent teeth to shift and alter the bite’s alignment. Depending on its location, the gap caused by a missing tooth can also cause difficulty speaking, biting, or chewing. Dental implants are currently the only tooth replacement solution that most closely matches both the aesthetics and function of a healthy, natural tooth. The three-part structure is comprised of a titanium implant screw, a natural-looking dental crown, and an abutment that securely connects the two. The implant screw is surgically placed into the jaw bone and mimics a natural tooth root, fusing to the existing jaw bone and helping provide healthy stimulation. The dental crown is made of a highly durable and life-like material and fits securely between adjacent natural teeth. With proper care, dental implants can be a long-term solution for missing teeth and help to keep the mouth healthy and functional. Drs. White and Haines utilize PaX-i3D imaging technology that produces 3D digital images of the facial structure. These comprehensive images of the teeth, jaw bone, sinus, and nerve locations increases the accuracy of treatment planning and surgery. “The 3D cone beam technology allows us to easily treatment plan dental implant cases by safely determining the depth we can place implants in the bone and the angle at which we can place the dental implants. This makes placing dental implants much safer and more precise,” said Dr. Haines. Patients with one or more missing teeth who are interested in the benefits of dental implants can turn to trusted dentist Dr. White and his partner Dr. Haines for high-quality care. New patients can schedule appointments by calling 704-896-9535 or visiting http://www.drswhiteandhaines.com.